Don’t let constant ear ringing stand between you and the sounds you love to hear. 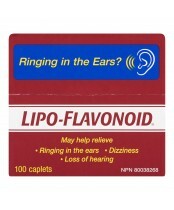 Lipo-Flavonoid Plus is a safe dietary ear health supplement that helps improve circulation in the inner ear. This enhances overall ear health —making you less susceptible to tinnitus and reducing the intensity of unwanted ear ringing. Lipo-Flavonoid Plus is made with safe, superior quality ingredients.